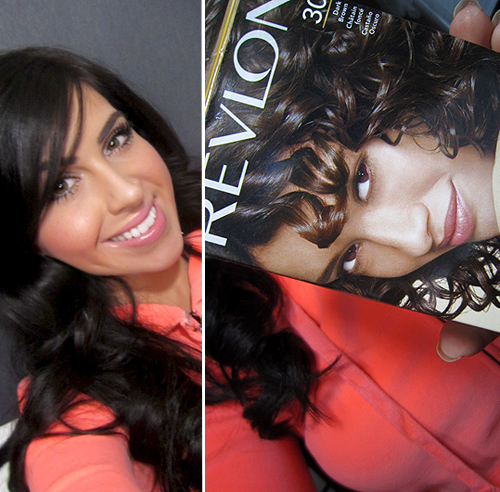 Revlon ColorSilk Hair Color in Dark Brown + A Few New Hair Products for Shiny Hair. I know, probably doesn’t look like much of a change, but my hair lately has been looking dull and lifeless. I figured it was time for a dye and picked up one that I’ve been using off and on for years – Revlon ColorSilk Hair Color in #30 Dark Brown. The instructions are to leave it in your hair for 25 minutes, and I always make sure to leave it in for the exact time, and not a minute over, or I’ll end up with almost black hair. Revlon ColorSilk Hair Color is actually the least expensive hair dye you can find at the drugstore. It’s only around $3 a box, and delivers just as well – if not better than the higher priced boxed dyes. The color is a very dark, rich brown. It can be somewhat drying, but I make sure to load on the conditioner to add some moisture back into my hair. For added shine and silky smooth hair, I picked up two products that I’m loving already. 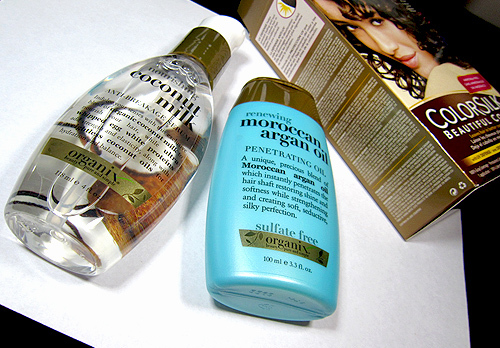 Organix Renewing Moroccan Argan Oil Penetrating Oil and Organix Nourishing Coconut Milk Anti-Break Serum. I actually used both products together on my hair, and it didn’t make my hair oily. They just made my hair super light, soft, silky and shiny! They also made my hair smell amazing. I would re-purchase the Moroccan Argan Oil for the scent alone. I will report back with a review on both products as I continue using them. If you use either of these products, I’d love to hear your thoughts about them. For my face, something really simple. 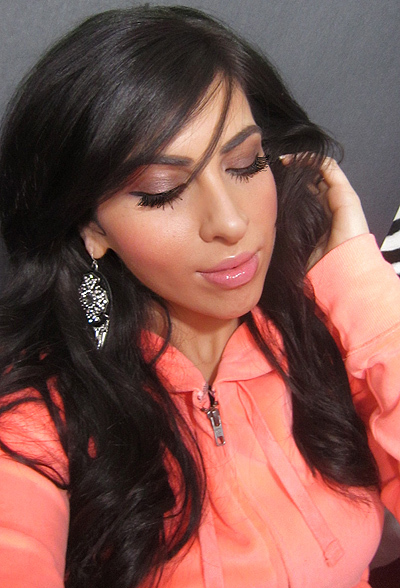 I’m absolutely loving the eye combo of Maybelline Color Tattoo in Bad to the Bronze with MAC Satin Taupe over top. Really beautiful and extends the wear of both shadows. 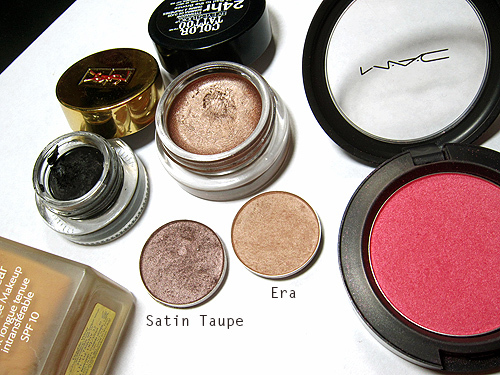 To soften the edge, I used MAC Era with a tapered blending blush. Then, I just added some black liner and mascara and that’s it! Maybelline Mineral Power Concealer Review, Photos and Swatches! NOTD: Essie Super Bossa Nova with Hearts! I use this exact brand and color everytime I dye my hair and I love it. It's just as good as any of the other drugstore dyes out there. Yor hair looks great and I love that lip color you're wearing! Ok it's official, I HAVE to get that glossimer!! I have used a sample of the Penetrating Oil once or twice before, it definitely helped my ends and made my hair look more healthy. However, I didn't get to use it enough to see if it was any better than other moroccan argan oils that are on the market. I look forward to seeing how you like it! I love this hair dye! I use the same brand, its only $3 and works better than other box brands. You look so pretty with your hair like this! Going to check out those Organix products… they look great! Very nice hair color! beautiful tone! thanks for sharing! great post, love the makeup! love it!! you looks gorgeous!! 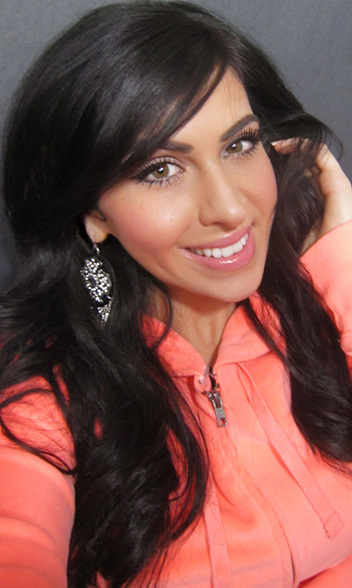 Your hair looks amazing – and the look is very Kim K, but much prettier! I could not live without argan oil – tried the organix for the price but I just love the smell of Moroccan Oil too much! Very pretty! I love the Revlon Colorsilk- its awesome how a $3 hairdye can be such great quality. I just ordered some Revlon Colorsilk in a blonde shade- I've heard so many good things about it 🙂 I wish they sold it in Canada. I have to try those items from Organix- I just tried some leave in Argan Oil cream- and that stuff works so well! I want to try out more argan and moroccan oil hair products. You make look BEAUTIFUL with your dark hair doll! Absolutely stunning! You look so pretty I love the hair color and defiantly want to try the oil and serum. My hair has been looking dull lately too from using the straightener. Ive tried the coconut milk from organix and it worked really well my hair is usually very dry but with this product it made it glossy and shiny. I recomend using a product i found in Target called Hollywood Beauty Argon oil Hair treatment from Morocco this smells so good and in the mornings when i wake up my hair is so easy to brush and it smells and feels so soft. I have just about given up on boxed dyes, my hair always comes out looking orange/red and it's brown naturally and I dye it brown. ^^ That doesn't even make sense what you just said. Her eyebrows are “fat”? Lol, I wasn't aware that eyebrows had to go on a diet of some sort. Lol, hi hater! Natty, I love your blog. Pay no attention to jealous girls! I've been getting several Anonymous comments regarding my “fat” eyebrows. I am very happy with my brows – in fact, I don't think I've ever been happier with my brows. When they were thinner, I had people commenting that I look “fake” because they were too penciled in. I can never please everyone, I can only please myself! And like I said, I'm very pleased with the way my brows are. As usual the thing normal and nice girls say their jealous of is always the first thing a hater will try to pick on. The color looks very nice on you. And you are very pretty. Your makeup and eyebrows look great. However, this hair colour looks black not dark brown. I am naturally dark brown and I know from experience that hair dyes that are “dark brown” always end up looking blackish not dark brown. Just a word of warning for those considering using this dye or any dark brown hair dye. I just used this color this afternoon. I love it! It came out a dark chocolate color. Love!! How long did it take for your hair to get those reddish tones in it we all often get after a few months? how many boxes did you use for your length?